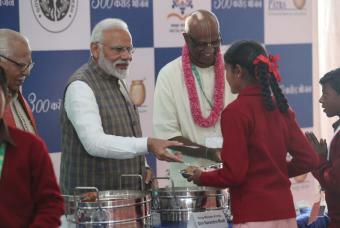 The Akshaya Patra Foundation has been recognised as the world’s largest NGO-run school lunch programme. It has also received accolades and recognitions for being an innovative and technology-oriented NGO in optimising resources, enhancing operational processes, and maximising the benefits of the school lunch programme. Akshaya Patra was considered to be a case study by Harvard Business School as part of their curriculum. The study revolved around India’s educational and socio-economical status, history and significance of the Mid-Day Meal Programme, and Akshaya Patra’s role in extending the programme. The case study touched upon the various aspects implemented by the Foundation in order to optimise operations and benefit more children. It delved into the dual-pronged distribution strategy i.e. the centralised model and the decentralised model of operations that enables the Foundation to serve nutritious meals to children of urban, semi-urban, and remote areas. Aside from focussing on Akshaya Patra’s core programme of serving mid-day meals to government school children, the study also reviewed on the other initiatives undertaken by the NGO such as distribution of medical services, inclusion of infants and expectant or nursing mothers, and feeding adult labourers. It also brought to fore the success of the programme implemented by Akshaya Patra in terms of number of beneficiaries, and health and education status of beneficiaries.